In recent years, our governments have realized that keeping the boardwalks — known as malecones — nice and pretty is not only good for tourism but also makes the lakeside communities very beautiful. They have invested more than two million dollars in renewing the boardwalks of the main towns around the lake and building others in some of the smaller villages and towns. Last weekend, a friend of mine from Puebla came to spend a few days in Ajijic and I decided to take her on a little tour of the north shore. We first went to Jocotepec. I was afraid that it wouldn't be a good day because it was kind of cloudy when we were having breakfast, but suddenly the sun came out. It was a Friday morning so there weren't too many people around. There is ample parking available, and you can have a soft drink and conversation on a bench while admiring the beautiful landscape. I love the fish sculptures on the boardwalk! Walking along the San Juan Cosala boardwalk was so relaxing! I hadn't been there before but a friend of mine told me I shouldn't miss it if I was taking my friend on a tour. Children were playing, having fun, and a couple of families were ready to have a barbecue on the grills installed there. Even a family of ducks were swimming together and a few herons rested by the shore. Locals use the boardwalk to do some exercise, walk their dogs, take a stroll or a walk with their children. At one time, it was just a park but now it has been paved and landscaped, with benches along its length. It is a nice way to end a visit to Ajijic, after having lunch in one of the many excellent restaurants or shopping while on a walk through the village. While on the boardwalk why not have ice cream for dessert from one the local vendors? If you're lucky, you might find an event going on at the outdoor stage they have. In San Antonio. the boardwalk is under construction, but they have a nice park on the lake shore where the boardwalk will be located. You can see kids swimming, having the time of their lives, young couples and senior couples enjoying the company of their beloved. It was so nice to visit these places, I already knew how nice it was to be here but I hadn't gone there in a while. It was even more special to show the place to one of my best friends, I am proud of this beautiful area where I live. I like the fact that people from San Antonio now have a place to have fun every day and do some exercise outdoors, because there are basketball courts, a jogging track, a play ground, and more. This park is on the way to Chapala from Ajijic, just at the side of the road. Walking around and seeing people enjoying themselves sharing time with their families makes me miss those days when I used to spend more time with mine. What can I tell you about the sunset from here? It is beautiful! From there you can see the lighthouse on Chapala's boardwalk. People from Guadalajara like to come on their free days because of the food. There are a lot of seafood restaurants, which are the most popular. But you can find practically any kind of food in Chapala, from Italian, French, Argentine to Thai, Indian or even fusion cuisine. 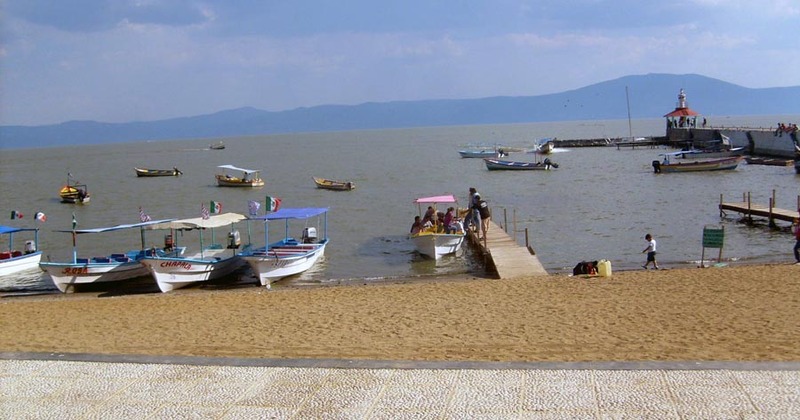 However, the true pleasure of coming to Chapala is to take a walk on the boardwalk, have an ice cream and buy some of the traditional candies. You can enjoy the view and maybe hire a Norteño band to play popular Mexican music and spend all afternoon with family and friends. This little town is about 20 minutes from Chapala. Their boardwalk is also under construction but people still enjoy it. We met a couple of families having a picnic and some tourists wanting to take a trip to the Mezcala Island. Also, if you go there and get hungry or thirsty, don't worry. There are a couple of improvised restaurants. I can't wait to see that boardwalk finished. Just the drive there is amazing — the mountain goes up and down and the view from each spot onthe road is awesome. I had so much fun that I can gladly show the North Shore of Lake Chapala to my friends any time. I can't wait to visit again.